The Finished WTD Bass- Trust me, I could've fixed this guitar in Photoshop faster and easier! Well, here it is ( and me too) with the "What The Duck" Ibanez SR 490 Bass Guitar that I won from Aaron Johnson, Creator of the "WTD" Comic Strip. The Bass is completely playable- ( Sorry 'bout that Aaron...) and sounds great! 3) Aaron's going to go far ( He's been accepted into syndication) and I want to be sure to cash in on his name later! Be sure to go take a look at http://www.whattheduck.net/ and enjoy the photography humor- you won't be dissapointed. Thanks for the sweet bass Aaron! The Guitar is in recovery now- As you can see, the front of the headstock sustained the most splintering- but overall- I'm pleased with how it's turning out! My next step is to let the stain cure 12 hours; then I'll buff it down, spray a clear coat over it, buff, and repeat till it looks like new- or at least as close as I can get! 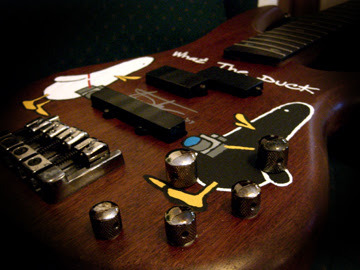 OK Everybody; The "What The Duck" Bass from "WTD" Creator Aaron Johnson is finally here! 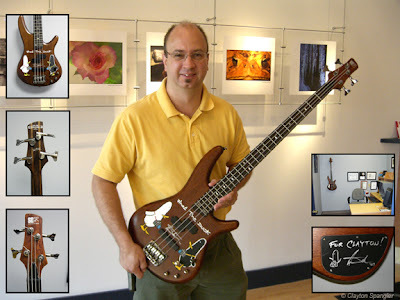 Check him out at http://www.whattheduck.net/ and buy something- he needs the money for a new bass! A) repair the guitar to playablility. B) If it isn't reapirable to play; at least have a place for guitar hooks to hold it on the wall of my office! 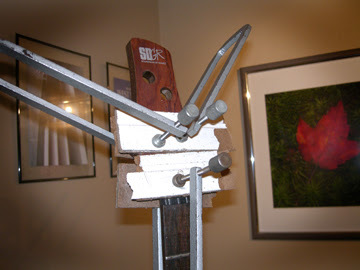 the break was fairly clean, so I am clamping the "wound " together with hopes it will be strong enough to restring. 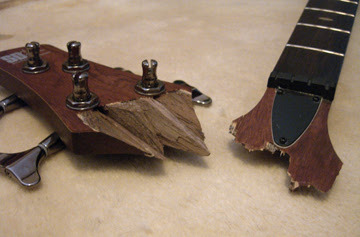 There is a veneer of Mahogany wood on top of the headstock that may be too damaged to repair , I have the "flecks" that came off of it- so we'll have to wait and see how bad the joint is after it's unclamped. I'll give an update on the "patient" in a few days with better photos of the artwork, signings, and the overall instrument. I took the clamps off this morning, and while the joint is dry- it needs to cure. The overall break is just a seam in the wood now, so I'm hopeful. 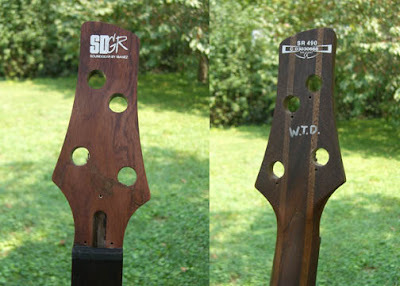 There was some splintering on the headstock that will take some work cosmetically to make it look right. If you're a photographer and haven't seen the "What The Duck" online comic strip; Where have you been! That being said- The artist and creator , Aaron Johnson is also a musician with the band called Sweet Jelly - He recently put his old bass on ebay and said that if a WTD fan won the bass, he'd sign and put a WTD sketch on it as an "incentive" to bid for it. I won the bid for the Bass- and after being emailed by Aaron with the preliminary idea for what he wants to put on the bass- All I can say is I CAN"T WAIT TO GET IT!